If you aren’t already familiar with a LAN, it is defined as a local area network. From the term local, you’d probably guess that LAN network designs don’t span a large region (and you’d be correct). 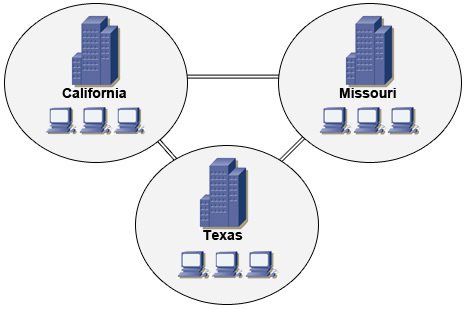 The basic LAN is just a simple network of computers, although LANs can often span multiple buildings. 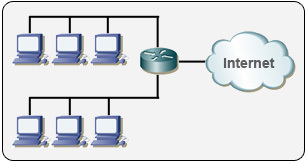 In the example below, you can see a network divided by a router, which is being used to connect the network to the internet. A LAN is a fairly easy concept to grasp- perhaps the simplest of all networks. In fact, computer networking started out with a simple LAN connection. Since the birth of the LAN, we have been graced with even more advanced technologies- such as the WAN. WANs are networks that interconnect LANs. You can think of it as a company who has offices in three separate states. If the company wishes to have each office on the same network, they would need to somehow connect the LANs together. Whereas a WAN enables you to send an instant message to someone around the world, a LAN would be limited to a much smaller geographical location. You are actually more familiar with WANs than you think- you’re using one right now! The internet is biggest WAN on Earth. 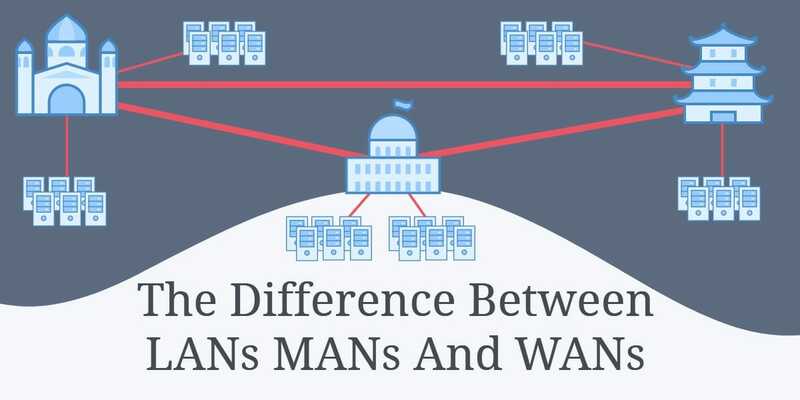 Looking at it from a global perspective, you can see a WAN as a collective of networks run by many people- whereas a LAN is often ran by a specific organization (and thus usually only has one administrator). Generally speaking, we could stop there. But we can further classify network designs even further with MANs and CANs. What are MANs and CANs? A MAN is short for metropolitan area network. As the name implies, it covers a metropolitan area- such as a city or the suburbs of a city. You can think of them as between what a LAN and WAN would be. They span a much larger geographical area than LANs, but do not often surpass the limits of a metropolitan area. MANs are generally good for businesses and organizations that have multiple locations around a city. A bank may also take advantage of a MAN. So, far so good, right? Well now we’ll introduce the CAN- the campus area network. You’ve probably guessed it- this type of network design spans a university or campus. It acts a lot like a MAN would in some cases, although it obviously has a much more specific purpose. Thus far the deciding factor on how we classify network designs has been the area they cover. The black sheep of this convention is the SAN: noted (and named) for its functionality- not its coverage area. A SAN stands for a storage-area network. It is a dedicated and high performance network that moves data between servers or other resources. The SAN is used to connect storage machines in a “farm” so that other parts of the network can take advantage of the storage space. You will commonly see a SAN connected to a LAN or WAN. 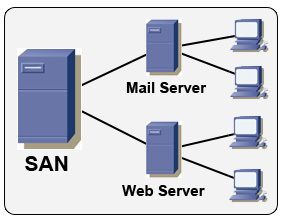 In the below example, we are using the SAN to store information the web and email servers may need. If you ever decide to start your own Fortune 500 business, your network will need to be very large in size. To help alleviate the strain on your network and stress from lack of disk space, a SAN will be all but necessary. Most SANs offer great disaster tolerance and scalability built in- something vital for keeping important company documents. Although you’d think we’ve just about covered it all, we can delve even deeper into network design. You may have heard of a WLAN, or a wireless local area network (which operates much like a LAN without cables). You might have also heard of a PAN- or a personal area network. These are usually used to describe small networks made between mobile devices such as phones. In the below example, you can see two devices connecting wirelessly- by Bluetooth, perhaps. Although you can be as specific as you’d like, most networking exams only require you know the basics of LANs, WANs, MANs, and SANs. This may change in the future, so be sure to keep an open mind about the upcoming network designs. We did, after all, only start networking computers with simple LANs. Just years after, we have the many “AN”s that we just covered- and there’s no telling what we’ll have in the years to come. It really helped me. Thanx a lot. LAN is used in the organization to connect various offices which located to the different cities. Through WAN, we can instantly send any message to anyone through the globe. The LAN is used for the limited number of the message.